Dreading the coming cold here as well. I wish we at least had a bit more snow to properly insulate all that has sprouted. We have cyclamen, amaryllis (two colors), hyacinths and paperwhites, lined up on our Vermont windowsills. We bring pots up from the root cellar every week or so, to keep a steady supply. We have finally gotten some decent snow and cold is headed our way as well. This has been an unsettling and odd winter for sure. I looked for Hyacinths yesterday when I was off the mountain top and the only ones I found were nearly dead already - yours are gorgeous! 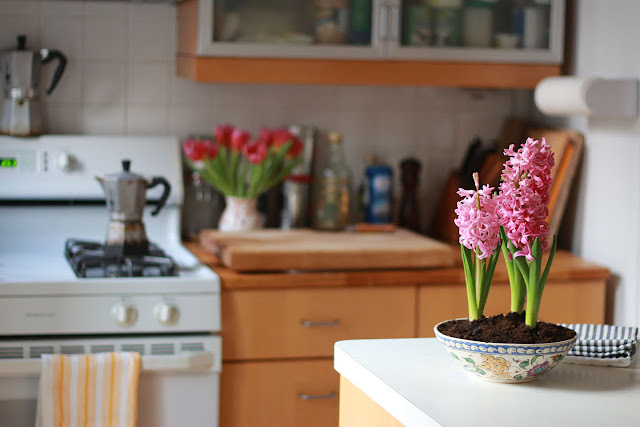 Oh, the aroma of Hyacinths is just heavenly! And now you can plant them in your garden after they are done blooming so you can enjoy them next year as well! Marie, I've also been thinking about my blueberries and the little cherry tree on my very exposed Bushwick terrace in this upcoming super-cold weather... is there anything I should do to protect them or just hope for the best?